Hong Kong is buzzing with excitement as the Hong Kong Houseware Fair at the Hong Kong Convention and Exhibition Centre right now. This fair will be going on from 20 April to 23 April 2013. Be sure to be there! 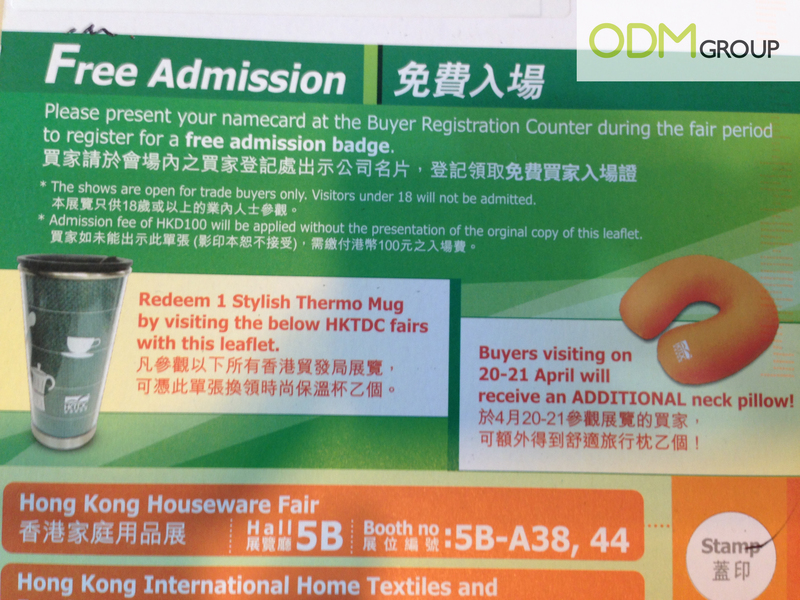 HKTDC is offering free trade fair gifts for everyone who attends the fair. A stylish thermo mug is given as a free souvenir while a neck pillow is given as a bonus souvenir during the first 2 days of the fair. Get these fantastic exclusive offers just by attending the convention. A thermo mug is a massively practical promotional product due to its usability. Everyone needs a mug, whether at home or in office, to have their daily dose of caffeine. The thermo mug would be especially useful during the winter season to keep us warm and comfy. A neck pillow would make the perfect marketing gift for frequent business travelers. This trade fair gift would certain act as a form of relaxation. Be it on the plane, train or even ferry. This product would be highly beneficial to the individuals who have trouble sleeping or resting. The pillow is made of very comfortable material and we are certain that you will get that well deserved rest. What we think of these trade fair gifts? With such a large surface, your company’s brand or logo can be imprinted on the surfaces of the products. With the high usability of the mug and pillow, your company will enjoy enhanced brand awareness and visibility. This product can be used practically everywhere, from home to your office, from the trains to the streets. These trade fair gifts could also be made of recyclable materials in order to help boost your company’s corporate social responsibility. With your company being involved in the preservation of the earth, more consumers that are concerned about the green movement would be highly receptive to your company.